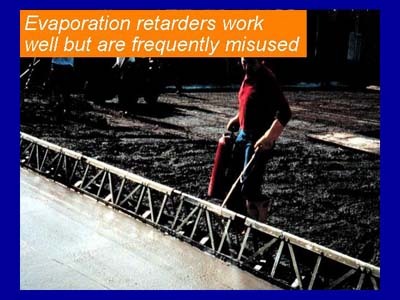 Here a proprietary evaporation retarder is being applied to the surface of the concrete. These products should be used during breaks in the finishing process. As soon as finishing resumed, the film applied will be broken and the protection from the product will be lost. These products have traditionally been abused and treated as "finishing aids." The products are largely water and can have the same adverse effect on the concrete as adding any other form of water to the surface during finishing.